The incivility of this heated political climate requires parents to cultivate compassion as strategically as the campaigns unravel it. This is the time to share with your children all the reasons kindness and respect are so essential; to discuss the challenge (and critical importance) of being an “upstander” in the face of offensive speech; and to exalt the power of every individual (even very small ones) to bring about positive change. Thinking through your responses before discipline is required is a common theme in all of these books and was key to my family's successful management of our behavioral low point (to date). Pick one, read it, and feel that much more prepared next time you face a parenting challenge that threatens to trigger an explosion. Try these 2 projects and see what a difference listening makes. Sometimes showing compassion for my own family members is the only act of kindness I get accomplished. Guiding children through big transitions - through fear or sadness or even uncontrollable excitement - can be all consuming. Have I mentioned my family of 3 kids, 4 chickens, and 1 cat is moving? For the most part, we're still keeping up with our regular habits of kindness, including Garbage Walks, collecting coins for the animal shelter, and participating in the One Book at a Time Program. But most of my emotional energy has been funneled into smoothing these next few weeks for the kids and their sweet friends. 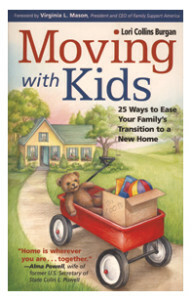 It's no surprise that moving is tough for children. Psychology Today reports that frequent moves, or long drawn out moves, can have a long term impact on a child's happiness and ability to build stable relationships. The good news is, parents can help limit the stress of a move with some targeted acts of love and kindness. Throw your own going away party. Initially, I was a bit embarrassed by this one, but it really is a must. After months of prepping our house for sale, searching for a new one, and endless packing, we needed a party. Each kid was given a stack of invitations to hand out at school and around the neighborhood. We held a simple open house in the back yard, just popcorn and a bounce house. Between neighbors, teachers, and friends old and new, well wishers filled our yard and our hearts for a very memorable afternoon. Pen Pal Kits: Label a few envelops with the new address, bundle them with stationary, and let the kids pass them out to favorite friends. Hopefully, the kids can look forward to a summer of letters and pictures to and from their special people. A Traveling Journal: For that favorite friend, keep a traveling journal to mail stories and secrets to one another throughout the summer. We haven't implemented this one just yet, our the eight-year-old girls who are about to be moved apart mention it nearly every day. I'll let you know how it goes. The wonderful world of technology offers so many other helpful solutions. Video chatting and e-mail will make the separation easier on everyone. Have you moved with children? How have you made the transition easier for your family? I have to fess up. My intention to Trick-or-Treat for UNICEF with the kids this year was a failure. Actually that implies I tried it without success. In fact, the lovely UNICEF boxes remain in the folder near my kitchen radio under a pile of other half-finished kid crafts. Why does this sort of thing happen? Then I didn't give it another thought. Between feeding and dressing three little monsters up in their costumes, then doing my best to keep up with them as they wandered the neighborhood, I didn't have 30 seconds of thought to give to anything else. Maybe this just isn't the project for us. I always get a little queasy when preparing to ask others for money, even when the cause is admirable. The kids are pretty reluctant fundraisers too. In contrast, everyone in my house is all excited about our new match in the Family-to-Family book program, so I'll use that enthusiasm to ensure success in that project! Did anyone else have better luck or find an easier way to turn Halloween chaos into a force for good? Are any of you active on Pinterest? If so, are your harboring a collection of wonderfully creative pins you'll get to someday? Even if Pinterest isn't your weakness, surely you have a stash of fantastic projects to complete with your children or around your house that you'll get to someday. And if you've been busy poking around our new Big-Hearted Families resources, I'm willing to bet you have a few plans to "do good" as a family someday. My family has been talking about making contributions through Kiva since last January! Since last winter we've talked about making care kits for the homeless, so we always have something useful to give someone in need. I have an e-mail hiding somewhere in my inbox, waiting for a scanned signature to begin our participation in the Family-to-Family One Book at a Time Club. All of these someday ideas clatter around in my head, jostling for attention between gymnastics and piano and the next camping trip. I'm struggling to find efficient ways to turn these many good ideas into accomplished tasks. Pick one thing & add it to the calendar: It's official. We're making care kits on Wednesday night. It's on the calendar. The whole family has been informed. My kids are looking forward to it, meaning I can forget, or claim I'm too tired. Add ingredients to the grocery list: No need to make a special trip to the store for granola bars, lip balm, cozy socks and water bottles. We rounded it all up during the last routine errand. Leave enough time to reflect! Discuss the good you're doing. Discuss how good that feels. And use this conversation to motivate one another to pick the next project. Pick the next project... and add it to your calendar. Whether you pick a day next week, next month, or after hockey season, knowing you have set time aside time for the next event will calm that irritating feeling of being hung up by too many good ideas and not enough time. How does your family get over the hang ups and begin doing real good? Inertia is a powerful thing, and any suggestions are welcome. Clearly, packed schedules get in the way of family time - or family volunteering time. But how do you find that line between over-scheduled lives and the reasonable pursuit of interests and skills each family member values? Even with the best of intentions, our weeks fill up, time flies by, and we find ourselves struggling to connect with one another as school, activities, and work pull us in many different directions. Honestly, I'm not here to authoritatively answer that question. My oldest is only in second grade. I do feel qualified to share our methods. Somehow this little second grade girl has told me, "No." She is saying no to extra activities this year. She came to me worried that she might be too busy to play with her sister and her friends. Or too busy to do some of the big-hearted activities we've come to love as a family. So the brownie sash is packed away in her keepsake box. I'll have to find my cookies elsewhere. Anyway, here are my six tips for strengthening family connections and keeping your sanity during this busy, back-to-school season. Feel free to add yours in the comments! 1) Set priorities: Too obvious? Maybe, but we all overlook this most basic of scheduling rules. Spend your next family dinner talking about (or re-affirming) your priorities, your family mission statement. You can keep it simple, or you can use these wonderful conversation starters from Simple Mom to take it deeper. Whatever you come up with, write it down and post your priorities somewhere handy for future reference. 2) Set limits: Maybe you want to draw the line at one activity per kid or at least three unscheduled days each week. Find what you are comfortable with, and defend your limits! 4) Eat Together: If it weren't for Family Dinner, we wouldn't have heard much about second grade. There is something about assembling tacos and chasing beans around with a fork gets a kids' mind to wander. By the time her plate is (more or less) clean, I feel like I've been to second grade! 5) Do Good Together: Make room in your schedule to volunteer together. Check out our projects page and sign up for our newsletter or our facebook feed for ideas to get you started. Also, watch for the launch of a brand new resource early next month! 6) (Re) Establish Kindness Rituals: Rely on at least one daily ritual to reconnect. Reading at bedtime can seem redundant once your child reads on her own. Let me tell you, it's not. My daughters and their dad are taking turns reading chapters from Where the Mountain Meets the Moon, without a doubt their favorite time together. Or you could share your daily gratitude at the end of the day. Or dance together. What are the daily rituals your family enjoys? Be sure to leave time for them as often as possible. The transition to new schedules, new grade levels, homework, friends, and independence levels can be a stressful time for a family. Remind yourself that less is more, in terms of scheduling. Even on the busiest weeks, build in a small moments of kindness. Connect with one another. You'll find these simple moments restore everyone's energy for the next big activity. How do you keep reasonable control of your school schedule? How do you build in breathing room even on the busy weeks? Ever since my third baby was born, our family volunteering efforts have been mostly confined to the kitchen table (you can find loads of ideas for at home projects right here). I know, I know... he's a year old. It's time for us to move out into the world. And we will. Both of my daughters have been asking repeatedly to deliver for Meals on Wheels again. Though it has been a little over a year since our last deliveries, the girls are full of fond memories of our former route. Our time will come. We'll probably start that adventure next summer when a) Mr. Toddler is steadier on his feet, b) when his napping schedule no longer runs into the 10:30 to 12 delivery time, and c) when Miss Second Grader can come along to help lead him around. Until then we'll marvel at our neighbors. My inspiring neighbor just signed up as an on-call MOW family. When the local center is short of delivery people and her family isn't otherwise engaged, she loads up the troupe and off they go. You can see how much they enjoyed the adventure. There were smiles all around when they returned. Because their stories are getting my girls excited about the Meals on Wheels mission again, we'll be doing a few at home mow projects. Join us! And share your story!